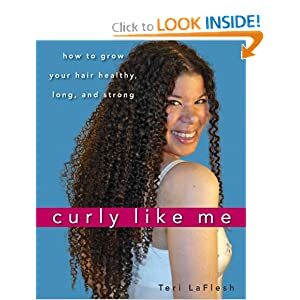 During my brief hiatus from blogging, I got to read Teri LaFlesh’s book, Curly Like Me. I have been to Teri’s website and her hair is BEAUTIFUL, so I was interested in what she had to say. Furthermore, I just love reading about hair. I won’t lie though…although there is some good information in this book, I found myself skipping through some parts and kind of giving some sections the side eye. The main thing I got from reading it is that while it is awesome that Teri found a method that works for her, we always need to keep an open mind and think about how what works for one person may not work for another. I skipped the first section with her hair story because that information is pretty much on her blog, so I had already read it. I also skipped the chapter on caring for baby curls because well…I don’t have a baby, lol! The pictures of her hair when she is younger are wild though – her transformation is absolutely amazing. Looking at those pics, you would swear she has a texturizer or does something to her hair like magic to get it to look like it does now. So no, I will def not knock her methods! I can definitely relate to her hair being stiff – but I’m not sure mine was like that due to damage but b/c it’s so thick and coarse it’s not meant to be straight. When I was a child, I could make Pippi Longstocking braids and they would stay up without wire. I actually thought it was pretty fun, lol! But wow, she was going through some stuff with her hair. I really started reading on the second chapter about the structure and vulnerability of curls. In this chapter, I really liked her metaphors for hair – they were very simple and easy to understand, and also cute. For instance, she refers to curly hair as a “frightened, fluffed-up kitten.” It seems big and tough, but it’s actually delicate and easy to hurt. These kinds of phrases are good for describing hair to younger girls who are transitioning, so I thought that was cool. For the rest of the chapter she goes through growing phases and structure, which is good information, but it can also easily be found via Google. Still, this chapter was overall helpful. When she gets to her techniques, I mainly agree with her, especially how to handle hair when shampooing (do not pile your hair on your head!). If I attempt to shampoo the length of my hair, it gets even more tangled, which is not the business. I’m fine with scrubbing my scalp and letting the shampoo run down the length as it’s being rinsed. As for the defining of the curls…goodness, I’m sorry, but that just seems to take too long for me! My hair is so dense that there is no way I would be able to define EVERY curl. That being said, I did like her information about the consequences of using heat and color – especially bleaching! I did color my hair a couple of months ago, but it was so short that I didn’t mind. I definitely won’t do it again! And the part about relaxers…oooh chile, a relaxer will never touch this head again. She talks about how a relaxer not only damages your hair when it is applied, but the damage continues because your cuticles are open and your hair can no longer hold in moisture. No thank you!!! In conclusion, while I was giving Teri the side eye a few times, I think this book contains some good information, especially if you are new to curly hair or you do not know how to care for your hair. But let me repeat – what works for one person may not work for another. If you start using cones and your hair starts to feel funny, please stop! Don’t think, “Well Teri uses them and her hair is beautiful, so it must be something else!” The best thing about silicones to me is that they are in cheaper products, so I’m fine using that conditioner as a shaving cream and won’t feel as if I wasted my money. Anywho, that’s really all I got. Let me know if you have questions!